Un film di Gino Nichele. Con Kelly Sheridan, Melissa Lyons, Cassidy Ladden, Chantal Strand, Maryke Hendrikse. 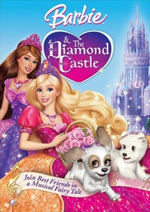 Titolo originale Barbie and the Diamond Castle. Animazione, durata 79 min. - USA 2008.